I practically grew up in our local branch of the public library in Memphis. I think my mom figured out it doubled as free child care, & I could spend hours going through the stacks without ever noticing the time pass. So when I heard the Lisbon city government spent 2.5 million € to fix up this public library, I couldn’t wait to check it out. The library’s name gives away part of its history. Built in the 17th century in what used to be the countryside surrounding the city, this palace was intended to be a getaway home for the Távora family. 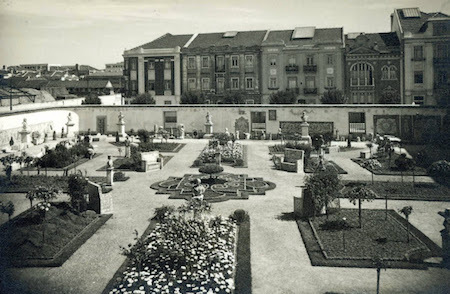 However, they lost all their property (& their lives) when the Marquês de Pombal accused them of an assassination attempt on King José I in 1758. Acquired by the fifth Count of Galveias about 50 years later, the property went through a variety of owners & uses until purchased by the city government in 1928. 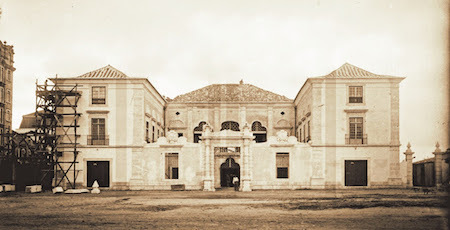 Although in precarious state, after renovations the Palácio Galveias became a public library from that moment on. Its recent closure in 2015 gave the city an opportunity to modernize the building & its services… most of the 600 daily users are students who need a quiet place with room to spread out. The library is worth checking out if you’re near the bullring/shopping mall in Campo Pequeno. It’s just across the street. With such friendly staff & a warm, beautiful space, I decided to add the Palácio Galveias to my Lisbon tile guide… it’s that special!